Blendtec is quite possibly, the ‘Rolls Royce of Smoothie Makers’. Famous for home-use Blenders, made to the same specification as their commercial blenders. Blendtec Blenders have been made even more famous by the ‘Will it Blend’ series of videos on YouTube. I have provided a link at the bottom of this section so that you can check out these brilliant videos for yourself (you would be amazed at some of the things they put in a Blender!). 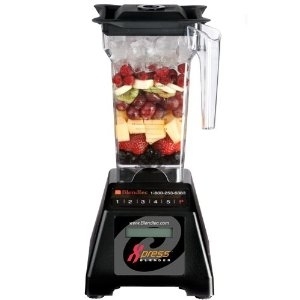 If you are in the USA, scroll down to the next section – if you are in the UK, Blendtec Xpress Commercial Blender is a brilliant Blender and Smoothie maker from K-TEC. Use the text link to visit the product page and get it for a great price in the UK. It has the powerful ICB3 motor which is 2HP (approx 1.5 KW). It is the smallest of the Blendtec family of blenders but still has the quality features which make a Blendtec Blender THE Smoothie maker to have. It has five pre-programmed speed settings, up to an amazing 3,000 RPM and includes the pulse feature (check out my article on features to look for). It has an LCD display and a very high quality 1.5 litre polycarbonate jug. It is rated five stars for both ease of use and cleaning (parts are dishwasher safe). All these features plus the direct drive motor and solid state electronics, make the Blendtec Xpress one of the very best Blenders you could possibly buy as your Smoothie Maker. It comes with a 12 month guarantee (5,000 uses if used in a commercial operation such as a juice bar or restaurant). Use this link to view Blendtec Blenders available from Amazon in USA – you can be assured of best prices and best deals. Use this Blendtec Blenders link to view the range available from Amazon UK where they are offering some great deals at the moment. Here is a link to the Blendtec Smoothie Maker Recipe page. Lots of delicious recipes for you to make at home whether you have a Blendtec Blender or not! Here is a link to Blendtec Will it Blend videos on YouTube with CEO Tom Dickson – enjoy! The Blendtec Total Blender, the Blendtec TB-631-20 The Professional’s Choice (pictured right) is the bestselling Blendtec Blender on Amazon.com and is available in white and red and available right now at a big discount – use the link above to visit the product page. If you are looking for a top of the range Blender or Smoothie Maker, check out the features on the top spec models. •Touchpad controls – set it and leave it – you can carry on serving the next cutomer whilst the blender gets on with preparing the order for your first customer. •Whilst there are usually around five blend cycles on a domestic model, the top of the range models have up to 30 pre-programmed blend cycles. Pre-programmed cycles mean that you get consistent results for any particular smoothie recipe. There is no doubt that Blendtec blenders offer excellence in terms of quality of product, performance and durability. The price tag reflects this but there are some fantastic offers online at the moment, particularly at Amazon.com – these appliances make a really good long-term investment and will give you years of reliable use, backed up by the Blendtec guarantee.